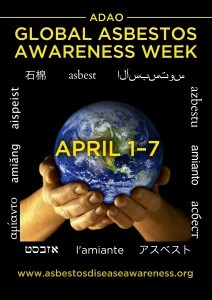 Global Asbestos Awareness Week: EXPOSED – The Facts About Asbestos concluded this past Sunday after a hugely successful 7 days of global advocacy, education, and community building. Beginning on Sunday April 1st on the heels of the 8th Annual Asbestos Awareness Conference, GAAW started with a candle lighting ceremony to remember all those we have lost to mesothelioma and other asbestos-related diseases and a blog from Asbestos Disease Awareness Organization President and Co-Founder Linda Reinstein highlighting “7 Reasons for 7 Days” to ban asbestos and prevent exposure. Day 2 featured highly informative content from two of the most respected names in the medical field who deal with asbestos, Dr. Arthur Frank “Why is Asbestos Bad for My Health?” and Dr. Richard Lemen “Asbestos: What is it?”. ADAO is so honored to have both of these great doctors as part of our Science Advisory Board and to have access to their limitless knowledge. Day 3 featured a statement from Dr. Phil Landrigan calling again for a global ban on asbestos. Dr. Landrigan is the President of the Collegium Ramazzini, an independent, international academy dedicated to advancing the study of environmental and occupational health issues. As Global Asbestos Awareness Week reached its halfway point, Day 4 featured some very exciting content from the British Lung Foundation and their “Take 5 and Stay Alive” campaign, which includes valuable information for those attempting Do It Yourself (DIY) projects around the home. In addition, ADAO hosted a screening of the documentary “Dust: The Great Asbestos Trial,” by Niccoló Bruna at the USC School of Cinematic Arts. This documentary focused on the Eternit trial in Italy, where Stephan Schmidheiny and Baron Cartier de Marchienne were both found guilty for their roles in the deaths of thousands through the asbestos manufactured in their plants. As the week rolled on, Day 5 brought information about the “Hidden Killer Campaign” by the Health and Safety Executive, aiming to spread awareness about asbestos. Day 6 featured great resources from John Newquist of the Occupational Safety and Health Administration (OSHA) “If You Think its Asbestos, it Probably is” as well as new content from ADAO on the Eternit trial, “Convicted! Eternit Asbestos Criminals Update.” As the week concluded with another candle lighting to honor the memory of those lost, we were again reminded of how we can come together as a community to put a stop to asbestos by Linda Reinstein. 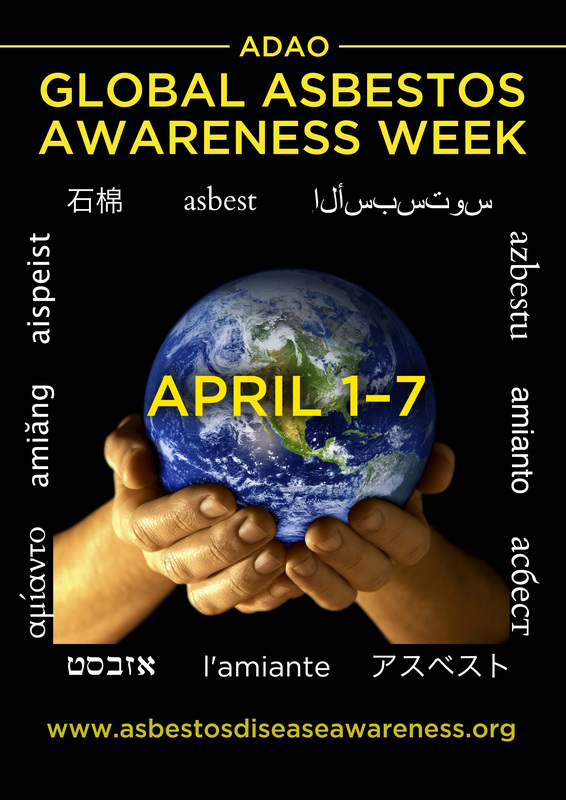 Global Asbestos Awareness Week was such a tremendous success and the amount of increased traffic to ADAO’s social networks, as well as our partners around the world, shows that our message is not falling on deaf ears. We look forward to sharing new and exciting content with you all next year, but not as much as we look forward to ending asbestos use around the world. Lastly, ADAO would like to thank all of our partners once again for their help throughout the week, the British Lung Foundation, the Health and Safety Executive, the Collegium Ramazinni, Dr. Richard Lemen, Dr. Arthur Frank, John Newquist and everyone who tweeted, shared, or posted about GAAW. A special thank you to our Platinum Sponsors Simmons Firm, LLC, and Baron & Budd, PC, and Gold Sponsor Motley Rice LLC., and our other sponsors for their generosity.